Irene Worth, actress, born in Fairbury, NE. Irene Worth was born Harriet Elizabeth Abrams on June 23, 1916, in Fairbury, Nebraska.Â Her parents, Agnes Thiessen and Henry Abrams, were educators and moved the family to California in 1920. Her grandparents, who were Mennonites, had settled with others in the nearby Jansen area of Nebraska during the late 19th century. 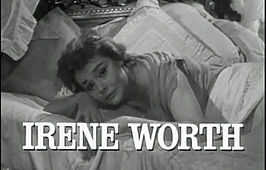 She changed her professional name to Irene Worth in 1942 just as she was making her stage debut in “Escape Me Never.”Â Best known for her work on the stage, she worked at the Old Vic and the Royal Shakespeare Company in London, before returning to Broadway in 1975.Â She won three Tony Awards, Best Featured Actress in Lost in Yonkers (1991), Best Actress, Sweet Bird of Youth (1975) and Best Actress (Dramatic), Tiny Alice (1965).Â She was also honored with an Emmy Award for PBSâ€™s Live From Lincoln Center: Chamber Music Society of Lincoln Center with Irene Worth and Horacio GutiÃ©rrez (1986).Â For her stage work, Worth was appointed an honorary Commander of the Order of the British Empire (CBE) in 1975.Â She died of a stroke in New York on March 9, 2002, at age 85.